THE BEST MOTORCYCLE WEEKEND ON THE ALGARVE! From the autumn of 2018, we will organize from October to May weekend (4 days) trail tours from our base in Faro with rental Honda CRF250L. From our base in a hotel *** with pool in Sao Bras de Alportel, we will ride in beautiful landscapes for 3 days. 4 days of tour / 3 nights, arrival and departure from FARO. About 550 km (80% off-road). DAY 1. Arrival in Faro. We will welcome you at Faro airport. We will drive you to Sao Bras de Alportel 20 minutes from the airport where a hotel *** with swimming pool will welcome us for the evening. Briefing. Dinner and overnight at the hotel *** with swimming pool. DAY 2. 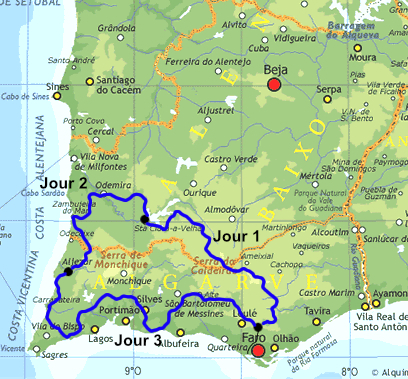 Sao Bras de Alportel - Santa Clara (180 km) From the start of the first day we will climb in the mountains of the Algarve, and we will start from the east of the massif which will offer us beautiful views of the coast. The beautiful winding tracks will take us to the wild Serra de Caldeirao where the small village of Sao Barnabé will welcome us for the lunch break. We will continue to walk in this very sparsely populated area until we reach the shores of Lake Santa Clara that we will follow. End of stage in Santa Clara a Velha where a charming and comfortable typical guest house will welcome us for the night and dinner. DAY 3. Santa Clara - Aljezur (180 km) For the start of the second stage, we will head north-west, and dense eucalyptus forests with a very special scent. 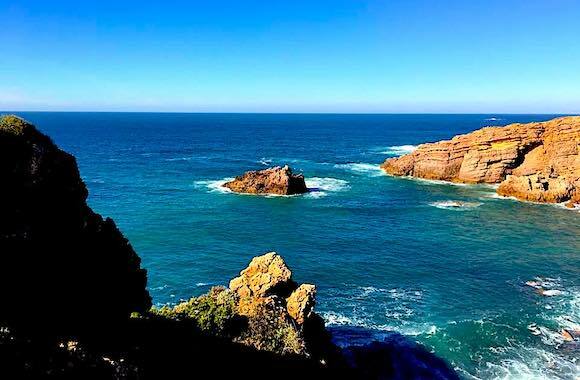 We will then dive to the beautiful Vicentina coast where we will have lunch at the edge of the ocean. Between sea and mountains in the afternoon, the landscapes will surprise us with their beauty and authenticity. End of stage in Vale de Telha near Aljezur, 2 km from the cliffs of the Atlantic Ocean. Hotel *** for the night and the evening. DAY 4. Aljezur - Sao Bras de Alportel (190 km). We will close this wonderful journey with a splendid stage that will start along the Vicentina coast, paradise for surfers. We will then cross Serra do Espinhaço de Cao from where we will be able to admire the west and south coasts of the extreme south of the Iberian Peninsula. After the lunch break in Silves, we will visit the surprising south coast and its pierced rocks before going back to the mountains overlooking the coastal towns. End of the loop at Sao Bras de Alportel at the departure hotel. We will organize a late afternoon group transfer to Faro Airport where you can extend your stay at the hotel of your choice or at the hotel *** where we stayed during the tour. William bonjour, Un petit mot pour te remercier de ce RAID ou j'ai vraiment pris monpied, superbes endroits pour la pratique de la moto tout-terrain que tunous a proposé. Prèt pour nouvequ départ, peut-ètre l'Espagne pour le printemps 2018.